For marketers who wish to reach the lucrative youth market, the relatively uncluttered medium of the school environment represents the final frontier access to a captive audience of millions of students. Meanwhile dwindling federal, state, and local funding for education has left many schools vulnerable to the advertiser’s pitch. As a result, commercialism has steadily increased in America’s public schools in recent years, often with little or no public awareness. Captive Audience examines this growing phenomenon through numerous examples of in-school advertising; interviews with teachers, students, parents, and activists; and a case study of community action to oppose an exclusive soda contract in the Pittsburgh school district. Media scholars and critics including Alex Molnar, Professor of Education Policy, Arizona State University; Henry Giroux, Professor in Secondary Education, Pennsylvania State University; No Logo author Naomi Klein; and Bill Hoynes, Professor and Chair of Sociology, Vassar College offer a broad look at the issues at stake. 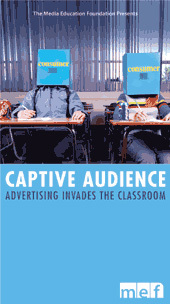 Captive Audience is a compelling expose’ of the transformation of classrooms, hallways, cafeterias, and textbooks into advertising vehicles. It explores how education is short-changed and democracy is at risk when schools become marketplaces and commercialism goes to the head of the class. SECTIONS: Intro: Advertising Invades the Classroom / The Shadow Curriculum: Sponsored Educational Materials / Channel One: Commercials in the Classroom / Schools in Need: The Politics of Funding / Sweet Deals: Exclusive Soda Contracts / Resisting Commercialism: Legislative Action / Resisting Commercialism: Local Activism / What’s at Stake: Keeping Schools Public.